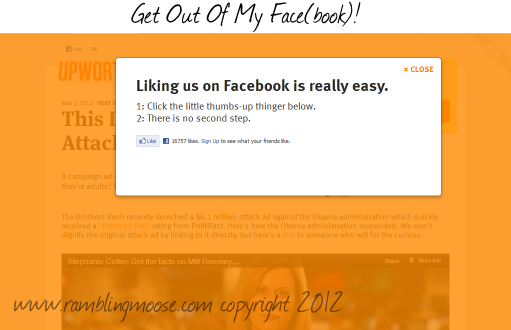 Rambling Moose: UI and UX - Get Out Of My Facebook! User Experience and User Interface is a term in web development these days. Basically the idea is that you should take a look at your website and think of it from the stand point of someone from outside. How is that person sitting in a random apartment somewhere removed from you going to look at your page and use it? Will that person say "Nope, you're ugly and your web developer dresses you funny and I'm leaving"? And that's about as technical as this article gets today, you can relax. You are looking at what really gets me these days. If I see a banner here asking me to like them on Facebook, I'm thinking of the socially awkward kid in elementary school who tagged along whining at you to take them with you when you do some cool stuff. How about the "Extra Needy Girlfriend or Boyfriend" who is begging for you to come over and spend some time when you're out fighting fires or some such? This is the modern web equivalent of me saying "Stuff it" I don't need you. Yes, I meant "STFU" and since I keep my blog G Rated, I will allow you to define that acronym however you like. You see, if I like this page and every page that I stumble across in the course of doing my daily research/entertainment/job hunting/shopping/ and so on, my Facebook page becomes a mire of inconsequential crap. I depend on my Facebook News Feed to be pertinent. It saves me from having to go to some of those websites and surf every single article to stay informed. I know I'm not alone here, many folks have started to use Facebook the same way. So why add all this junk? My first impression of the page is now "Oh for crying out loud, not again". Or something stronger if it is the 43rd time I've been greeted by this kind of needy uselessness. A Web Page, just like a blog, is what the owner wants it to be, and not the reader. You are the product, you are not the customer. You are typically being sold for your information. So being slapped in the face by a Facebook "Like me" whine is their way of roping you in for a little extra advertising face time on Facebook. My Second impression is to click on Adblock Plus and see if I can find the script to defeat it. Sometimes I can, other times I can't. Usually I hit about 50 of these useless needy girlfriends (I'm A Guy, Ladies, Don't Get TOO Bent Out Of Shape, Just Mentally Remap it to Boyfriends or Lost Puppies, MmmKay?) in the course of a morning. I do a LOT of research on technology and software/web development in the course of a day. Getting slapped by www.pleaselikemeorIwillwhine.crap doesn't make me like you any more than finding another flaming bag of web garbage sitting on my virtual doorstep would. 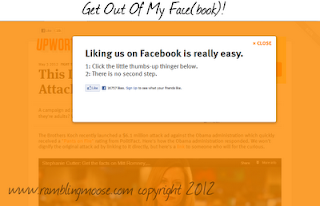 A Facebook Like button is fine, completely repainting your page with a "lightbox" like you see above is a great way to get people to move on like I did. It's the modern equivalent of a web pop-under window now that everyone has that little box clicked in their setting of their favorite browser to stop pop-up and pop-under windows as a default. This one will be the next default, give it time. So if you want to experience this stupidity for yourself, it was at this link on www.upworthy.com. I closed the page, I don't even know what viral information was there. Maybe after I switch to decaf... Nah, I just closed the window and I won't bother watching this supposedly important video as a result. I Know I Am Not The Only One Out There Annoyed By This Garbage. So folks, its a terrible idea to annoy your customers. It doesn't work in the real world. If that grocery store changed their piped in music to, say, Death Metal, a small percentage would love it and their sales would generally drop from all the sweet grannies who can't understand why they're playing growling in the frozen food aisle.